Brilliant news for your captain to sign a new deal with the club! Hopefully it is the start of a chain events which will bring further success to the table! What tactics are you playing with now? ScottT: It’s a huge piece of business because I was really afraid that he would reject a new deal in search of a bigger pay cheque in France with Bordeaux, but him signing a new deal is amazing news! If he doesn’t get a call up with the form he’s in, I’d be gobsmacked! Jack: Being home grown at the club is a huge boost for us, especially because he’s such a key player in the squad! He’s definitely a fan favourite and already one of my favourite players too! Justice: We’re on the right path that much is for sure! pickshield: Currently using a 4-2-3-1 wide, getting the best out of a lot of players right now! Boom-boom-boom! Three strong results to go into the mid-season break with! An opportunity to rest some tired legs and to begin planning out the second part of your assault on the league title! Three very important results to strengthen your hold on top spot. Hopefully the mid-season break will allow the players to rest up and not affect the momentum too greatly. Christopher Steegmann today confirmed that Austria Wien’s first piece of business in the January transfer window had been completed as the manager proudly unveiled Die Vielchen’s latest signing Marcel Canadi. The 21 year old Austrian midfielder completed his £1.1 million move from Erste Liga side SC Austria Lustenau earlier this morning and the former Borussia Monchengladbach midfielder will be hoping to become a key component of Christopher Steegmann’s squad in the closing stages of this season as the hunt for the Bundesliga title heats up. Initially a prospect of Austria Wien’s youth academy, Canadi has signed a contract with Die Vielchen until June 2022. Canadi spent his youth career at Austria before catching the eyes of scouts for German Bundesliga side Borussia Monchengladbach. However the 21 year old midfielder failed to break through into the first team in Germany and subsequently returned to his native Austria in 2017 with Austria Lustenau in the Erste Liga scoring a single goal in 12 appearances for the second tier club last season. This season has again seen Canadi return similar stats scoring only once in his 14 league games for Austria Lustenau. However, it is believed to have been his all round play and ability to fill the hole in behind the striker that has caught Christopher Steegmann’s eye. 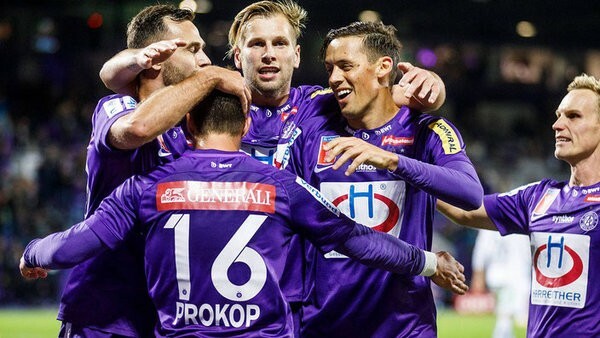 The German manager of Die Vielchen is believed to be keen on developing Canadi into a key player in this Austria Wien team that as of right now looks set to challenge for the Bundesliga title come the end of the season. With Alexander Grunwald in fine form, it remains to be seen how much Canadi will feature for Die Vielchen this season but the youngster will no doubt be keen to impress in any opportunities he does get between now and the end of the season. Fresh off the back of his £1.1 million move to the Generali Arena from Austria Lustenau, fk-austria.at got the chance to sit down with new recruit Marcel Canadi for his first interview as an Austria Wien player. Canadi spoke about making the step up from the Erste Liga, what made him choose Austria Wien and the challenges he faces trying to break into the first team ahead of club captain Alexander Grunwald. Marcel, welcome to Austria Wien, how does it feel to be back at the club it all began for you? Thank you! It feels great to be back here. I never had the chance to play for the first team when I was an academy player before Gladbach snapped me up so it feels brilliant knowing that I’m going to get the chance to really make a name for myself here now and play at the Generali Arena and show the fans what I can do. How are you settling in, what has your first couple of days been like? Yeah they’ve been great thanks. It’s been a crazy few days in truth, having to look for a place in Wien is tiring and seems to take a long time but I think I’ve finally found somewhere which means I won’t be staying in hotels much longer. At the club though, everyone’s been really welcoming and friendly making sure I’m included and I’ve got a good feeling about my time here and I know I’m going to settle in incredibly well. What made you choose Austria Wien, there was a number of clubs rumoured to be interested in you? Firstly, the chance to come back here and make a name for myself, having been away was probably the main drawing force. It’s such a big club, a special club and I’ve never stopped thinking about it since I left. But, having spoken to the manager and some of the senior players here, mainly Alexander Grunwald and Dominik Prokop, who I’m really close with, they said how exciting it was to be here at the moment. The club is in a great position in the league and exciting things are happening for the team, especially with the potential of European football next season. By joining Die Vielchen you have made the step up to the Bundesliga, joining a side challenging at the top of the table, from Austria Lustenau, who are challenging for promotion from the Erste Liga, are you confident in being able to make the step up in quality? Absolutely I’m confident. I would have been foolish to make the move here if I wasn’t confident. We’ve been performing well at Austria Lustenau this season and hopefully they can go on to consolidate that effort by getting promoted to the Bundesliga ahead of next season and we can have a reunion next season. I’m only young and there is lots of time to develop but I think I can have an impact in the first team almost immediately, and hopefully make a big contribution to helping the team win a first league title in a little while. 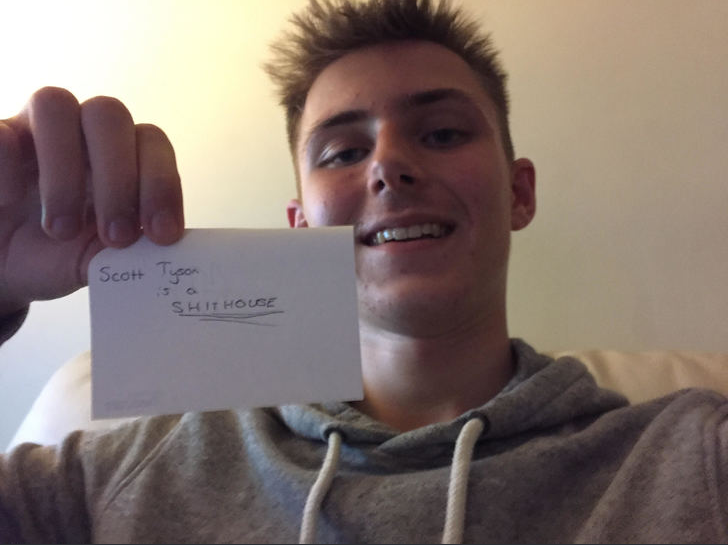 How much interaction with Christopher Steegmann have you had since joining and what has he said to you? We had a lengthy conversation in his office on the day that I had my first training session with the rest of the team. We spoke about what I wanted to achieve here and he basically wanted to make sure I was settling in well. He told me what was expected of me because of the position the club is in at the moment and that he was confident that I could make an impact. We spoke a lot tactically about the role I will take in the team if and when I get that chance in the first team because the system here is very technical. It made me feel really good to be honest, knowing that he had taken a shot on me and was confident that I could fill a very specific, demanding role in the team. Obviously the team is going really strong at the moment, do you feel like there is a pressure on you to hit the ground running if and when you are given the chance in the first team? Hell yeah! 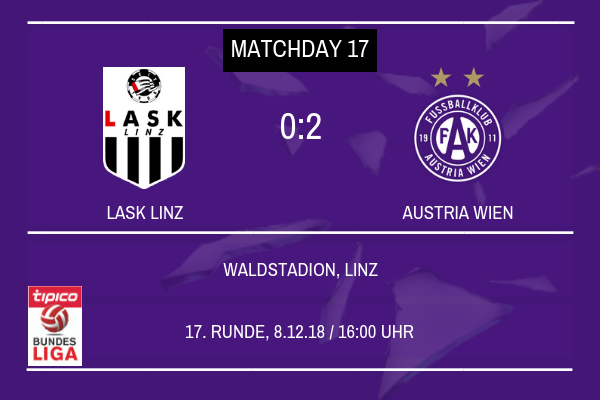 But then I think that was always going to happen, such is the size of the team and the importance to this club that Austria Wien is getting victories and challenging at the top of the table. Of course, we’re doing that this season and going really strong in the league so during any minutes on the pitch I get this season, I’m going to have to make sure I am making an impression and showing the fans what I can do. You play in a similar position to club captain Alexander Grunwald, is there a part of you that is wanting to learn from Alexander? More than a part of me. Alexander is the captain and a real icon at this club at the moment and the fans love him. He is a very strong player and offers this team everything, work rate, goals, assists and displacing him is going to be extremely hard. Alexander’s already spoken to me at length since I came here and offered to take me under his wing and help me develop and said he was looking forward to the banter he wants us to have because we’re both going to be going for the same position in the starting eleven. He told me to approach him with anything so I’m definitely going to make sure I am doing that and learning from him. The squad hasn’t been announced yet, but are you looking at the mid-season tour in Slovenia and the subsequent friendlies as a chance to impress Christopher Steegmann and make a claim for a first team spot? Absolutely! Christopher has told me that I’ll be going to Slovenia with the team and getting the chance to impress in the games against Domzale, Olimpija and Maribor and I’m going to try my best to take those opportunities and show him what I can really do. The competitive games are still a little way off yet so I need to impress here if I am going to earn a place in the squad for the big games that are going to come thick and fast when competitive football returns. You have the chance to make your competitive debut for the club in the OFB-Cup Quarter Final against bitter rivals Rapid Wien, do you think you’ll be ready to play a key role in that tie come kick off? I hope so, it would be an incredible game to make my debut in but I would understand if, in a game of that magnitude I wasn’t given the chance. Obviously it’s a few weeks away so if I want to play a part I’m going to have to work very hard to put myself in the manager’s thinking for such a big game, I mean it is a cup quarter final after all. Well, that brings this interview to an end Marcel, thank you for joining us, are there any last words for our supporters? Thank you for giving me the chance to return to this club, I’ll be doing my absolute best to repay your faith in me and this team and I’m looking forward to a lot of successful years here at Austria Wien. Next Update: #24 Steegmann: "No European Football Has Boosted Us"
I can't pretend I know anything about him, as I don't. However, I am confident in Steegmaan's abilities to find the right player for his side and look forward to what he brings to the table during the remainder of the campaign and beyond. With the mid-season break beginning to draw to an end in the tipico Bundesliga, all 12 of the Bundesliga clubs are back in training ahead of the final fixtures in the initial stages of the season and the busy final stage of the season when the 12 teams will be split into two groups of six. 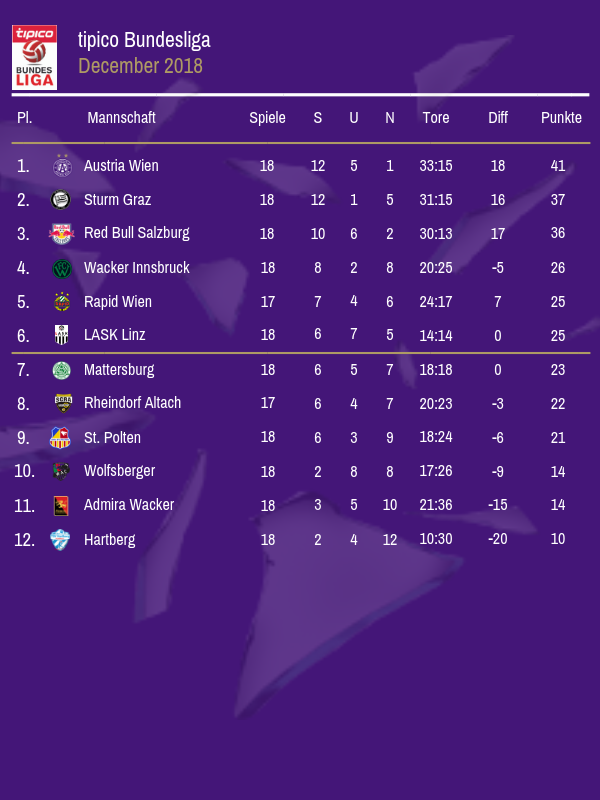 Leading the way out of the whole division is Austria Wien, who currently sit four points clear at the top of the table. 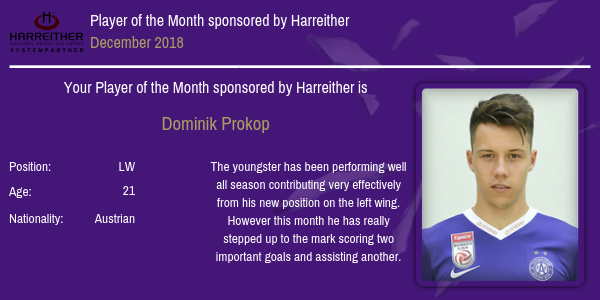 Having finished 7th last season, their revival has been inspired by Christopher Steegmann who today took the time out of his sides mid-season tour of Slovenia to talk to bundesliga.at about what the rest of the season has in store for Austria Wien and Die Vielchen’s pursuit of the league title. Right let’s just get straight into this Christopher. 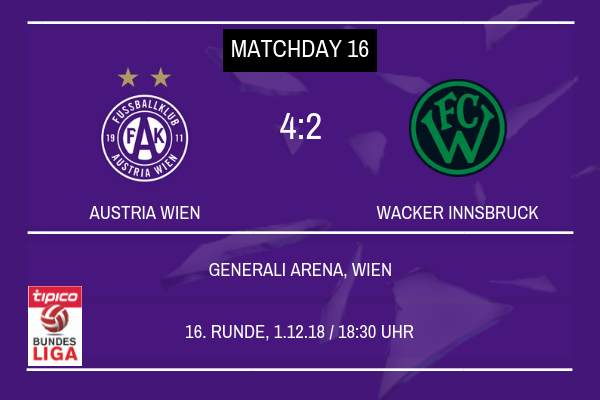 It’s been an incredible season so far for you and Austria Wien, how are you feeling about it all? I think you’ve summed it up perfectly to be honest, it’s been incredible. I never expected us to come flying out of the blocks the way we did and establish ourselves in this position as quickly as we have done. It is testimony to how hard the team is working for me and for each other though that we are doing as well as we are and hopefully we can maintain the momentum we have right now and the performance levels and come away at the end of the season having achieved something very special indeed. You’ve got four fixtures left until the league is split in two, the Championship group and the relegation group. You’re already guaranteed to be playing in the Championship group and going for the title and you said at the start of the season you didn’t think a title win was possible this season, has your view on this changed now? I don’t think I’ve had a choice but to change my opinion on it. At the start of the season I felt like it was going to take a while for the way I wanted us to play to start getting results but it has done it far quicker than I had expected and we’re left fighting for the title now which is incredible. We want to make sure we’re picking up silverware at the end of the season now because we’ve put ourselves in such a strong position moving forward. You return to competitive action with a mouth watering Wiener derby against Rapid in the cup Quarter Finals before facing both Sturm Graz and Salzburg in your final four fixtures, are you confident your team can get the job done against some tricky opposition? They return to competitive action a lot earlier than you do, with Europa League football and a game in the Bundesliga. Absolutely. They might have that competitive match sharpness that comes with playing that high intensity football but after two very intense games against Rennes (in the Europa League) they will be tired and their game against Rheindorf Altach will require them to be at their very best in the league too. Meanwhile we’re going to come into the game, admittedly off the back of some very intense training, but fresh and ready to go at them with all the intensity we have been going at teams with all season. We’ve played them twice this season already and picked up four points in the league so I am more than confident we can beat them in the cup. With Austria Wien finishing seventh in the Bundesliga last season, you have had no European football during this campaign, how much do you think, if at all, that has helped your campaign and run for the title this season? Not having European football has definitely boosted us this season and played a part in why we’ve been able to go full tilt at the league title and hopefully the OFB-Cup. We’ve quite often had a week long rest between games which is huge for the players recovery after some big games but also because we’ve been able to have full weeks of training sessions and that has allowed us to really get to grips with how we want to play and I think you’re seeing the results of that on the pitch now. You recently signed a new two year contract extension at the club, just how happy with that new deal are you? Yeah, it is definitely something that I am feeling very happy about. I am really enjoying life here, the results do help but everything about the club and the culture and the city is amazing and long may it continue now I’ve signed this new deal. This is a long term project for me, and although we’re doing better than anyone forecast for this season the project is far from complete. We’re going to make a lot more memories you can mark my words. 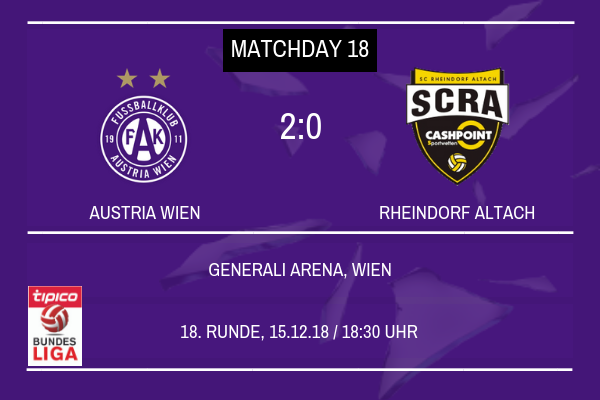 It was a relatively busy January transfer window for you and Austria Wien, we’ll come to the departures in a minute but how has the new signing, Marcel Canadi settled in to life with Austria Wien? Marcel has settled in really well. He’s featured in both the friendlies against Domzale and Olimpija Ljubljana and has done well to say he’s only had a few weeks of training under his belt with us. It’s going to take a lot of hard work on the training ground and ultimately it’s going to take giving him more and more minutes for him to come and realise his full potential in the role we want him to play but at 21 there is still lots of time for him to realise that and achieve and become what we want him to become. He could become a very special player for us. You had three first team players depart the club with Christoph Martschinko joining Swansea City, Alon Turgeman returning to Israel to join Beitar Jerusalem and Christoph Monschein joining St. Polten. What was the thinking behind allowing three first team players to leave the club? All three players will be sorely missed around the club but none of them had played much football this season and with the ages they are at, I felt it was best served for them to go and try and find more regular football elsewhere and hopefully for their sakes and their careers they’ll go and do that at the three clubs they’ve joined respectively. Obviously with the Bundesliga return a few weeks away yet, you’ve been on a tour of Slovenia in the mid-season break, how have you found that and how have the boys been performing? Yeah it’s been a very enjoyable experience and I think the boys would say the same. We’ve worked hard to get back to the levels we were at before the mid-season break, on the training pitch that is and hopefully that will be evidenced when competitive football returns and we meet Rapid Wien in the cup in a few weeks time. We’ve performed really well in the two friendlies we played against Domzale and Olimpija, playing the kind of football we want to and have been utilising to good ends in the league. We’ve got one more friendly against Maribor coming up, which should be the toughest test of the tour but that will stand us in good ground for the Rapid game if we can come away with a positive result against them. If Austria Wien go on to win the league and secure Champions League football by doing so, does it worry you that some of your best performers this season may attract the interest of clubs from other leagues with perhaps more money than those in Austria? Yes, that is a concern, but it’s not a major one. We’ve seen already that our key players, like Alexander Grunwald are committed to this project and want to stay here and play their football for us. He signed a new deal to fend off interest from the likes of Bordeaux so I am confident that other key players will do the same. Hopefully come the end of the season we’ll have European football to offer them next season and offer to any new recruits too. Just what would Champions League football mean to you as the manager of this team? To qualify for the Champions League in my first season here would be incredible and a huge honour. It is the best tournament in the world and would give us the chance to test ourselves against some of the best teams on the continent, in the world even. We know we’d have to get through some tough qualifying rounds, but with the players we’ve got here now and the players we’d look to bring in, I am confident we’d be able to do ourselves proud in that competition. Finally, with the January transfer window over and done with and three first team players being sold, will you be busy in the summer transfer window and when do you start scouting players and beginning the initial stages of the recruitment process? There is a long way to go until that point yet but we’ll definitely be looking to improve this squad again in the summer, whether we win the league and/or cup or not. The initial stages of recruitment never really stop if I’m being honest, not for me anyway. I am always looking for new players and thinking about how they could fit into the squad and contribute to the system and improve us. We’ve already got a list of players in mind for the summer and we’ve already got negotiations ongoing with some players that we’re very excited about that can come into the team and improve us. Well that concludes this interview, thank you Christopher, good luck for the rest of the season. ScottT: Nope, I’d never heard of him either but that’s part of the fun of doing saves in lesser leagues for me, discovering players you’ve never heard of and seeing what you can turn them into! Hopefully Canadi can become a signing that boosts your chances of winning silverware significantly! Working alongside Grunwald will be of fantastic benefit to his development, he has a bright future back where it all began for him! I am from Nepal and new to this community.Its a very busy life right now but I plan to do a story in the future. 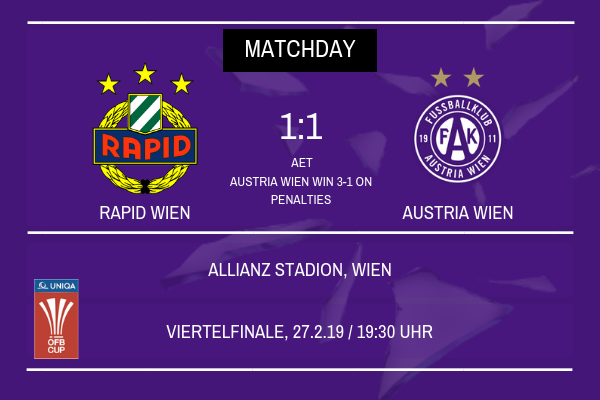 Austria Wien sealed their place in the Semi Finals of the OFB-Cup tonight after a hard fought 1-1 draw at the Allianz Stadion saw their game go to extra time and penalties. In the shootout, it was Patrick Pentz who was the hero as he saved three spot kicks from the home side, and alongside his team mates who slotted their spot kicks away, secured Austria’s place in the final four of the competition. Both sides will feel that they had done enough to win the tie over the 120 minutes, although the extra half an hour played in extra time could become a hindrance for both teams as they continue their search for league success, particularly for Austria who travel to Admira Wacker at the weekend in their first Bundesliga game since December. Both Dietmar Kuhbauer and Christopher Steegmann will now face the prospect of having to rest and rotate key players during the weekends round of fixtures in the Bundesliga with their likely to be some tired legs in both camps after this gruelling test. 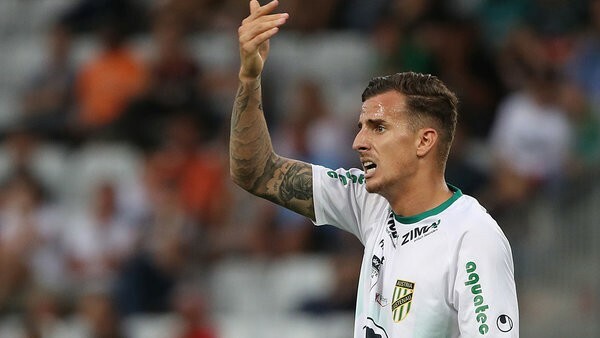 Rapid will also count the fact that they played 113 of the 120 minutes of the game with only 10 men after Thomas Goiginger was sent off for a vicious two footed tackle in only the seventh minute, meaning the home side were up against it for the remaining and biggest chunk of this Quarter Final clash. Austria were also rocked by an injury to Florian Klein in the 28th minute, with the veteran full back pulling his ankle ligaments meaning he will miss the next two weeks of action and possibly further depending on the severity of the injury. Klein’s injury meant Austria were depleted of a valuable attacking option on the right flank as Thomas Salamon was forced to replace the 32 year old, playing on his weaker right hand side. It was an absence that was noticeable as Austria struggled to play their fluent attacking football, especially down their right hand side, with Salamon looking to get the ball on to his stronger foot. Despite having a man less than their bitter rivals it was Rapid who took the lead nine minutes before half time as Spanish forward Angel was slipped through into the penalty area with the former Getafe man slotting home with a cool composed finish. However Austria were in the ascendancy and Kevin Friesenbichler was the man who saved his side in the 73rd minute, not long after he had been introduced as a substitute with a powerful finish under the Rapid goalkeeper to make it 1-1. Both sides had chances to win the game in extra time but ultimately it was a dreaded penalty shootout that decided the winner between these two with Patrick Pentz saving Rapid’s 1st, 3rd and 4th spot kicks to hand his side the victory and a place in the last four come the beginning of April. Austria fans will absolutely love that result. Victory is sweet; but winning on penalties is even better. What a dramatic match! Surely nobody saw that coming! That is a fantastic victory, bittersweet!